Set in the heart of downtown Portland and known as the largest hotel in the state, this hotel is surrounded by restaurants, entertainment, shopping and many popular attractions. 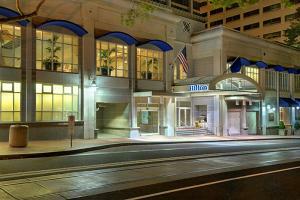 The hotel comprises two buildings: the landmark Hilton Portland and the elegant Executive Tower. Accommodations include a variety of inviting, contemporary rooms and suites, many with city views. Located in downtown Portland, about 10 miles from Portland International Airport.